Corban University received a B-. Washington Monthly's ranking of 328 out of 346 of Baccalaureate Colleges - Overall Rank was a major contributor to this grade. Located in Salem, OR, Corban University is an earnestly faith-centered institution devoted to professional studies and the liberal arts, with all programs centered around the teachings of the Bible. The ardently religious students in this small school participate in student led fellowships, which are not unlike traditional fraternities and sororities. What is a typical Corban University student like? Describe the type of person that should attend Corban University. What are the top 3 reasons someone should attend Corban University? What was a typical Corban University student like in high school? Describe the type of person that should attend Corban University. To build a Christian community that promotes worship, creative expression and activities that reflect God's character. To cultivate a life of stewardship and service toward God, humanity and creation. Corban University has its roots in Phoenix, Arizona where it began as a Bible institute in 1935. Relocating to California in 1946, the university changed its name to Western Baptist Bible College and operated there until moving to Oregon in 1969. In 1955, the University received degree-granting status from the State of California Department of Education. In 1959, it received national accreditation as a Bible college by the American Association of Bible Colleges. 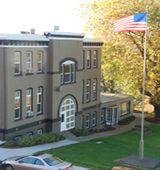 In 1968, it was regionally accredited and after moving to Oregon was accredited by the Northwest Commission on Colleges and Universities. Over the years, the University has gone from a Bible college to a university offering programs in biblical studies, the liberal arts, and professional studies. In 2005 the name was changed to Corban in order to enhance our ability to reach out to all evangelical churches. The name, a biblical word meaning "a gift dedicated to God," and motto, "Dedicating Heart and Mind to God," reflect the mission of the university. What are the top 3 things that students do for fun at Corban University? Campus housing is available for undergraduates. Housing deposit : $100.00. Housing deposit due : Aug 1. Housing deposit is not refunded if student does not enroll.. Freshman allowed to have car. No pets. The average student pays $23,853 for tuition, fees, and other expenses, after grants and scholarships. Total stated tuition is $26,976, in-state and on-campus, before financial aid. Learn more about financial aid at http://www.corban.edu. Estimate the net price for you at http://npc.collegeboard.org/student/app/corban. Corban University participates in the NAIA Division II for college athletics. Want more info about Corban University? Get free advice from education experts and Noodle community members.